Figure 7.1. Pacing stimuli present with intermittent failure to capture. The large unipolar stimuli are readily identified. The gentle downslope following the ineffective pacing stimulus is an RC decay curve. The pause is due to appropriate sensing of a native QRS, which is virtually isoelectric in this lead. RC = resistance capacitance. Figure 7.2. Evaluation of the atrial capture threshold while monitoring the surface ECG (top tracing), telemetered event markers and intervals, the atrial electrogram (middle tracing) and the ventricular electrogram (bottom tracing). Capture is present at 1.00 volts and 0.4 milliseconds. This is visible on both the surface ECG and the atrial EGM (arrows). With loss of capture at 0.75 volts, there is the loss of the large complex on the atrial EGM and a loss of the visible P wave on the surface ECG. The atrial output is bipolar resulting in a diminutive stimulus artifact that is virtually invisible on the surface ECG. Effective blanking on the intracardiac atrial EGM prevents distortion of the EGM. results in a uniform, relatively large "pacing artifact" generated by the ECG machine itself. This precludes differentiation of unipolar from bipolar pacing. Even nonpacemaker signals may be displayed as a pacing stimulus with these recording systems. The differential diagnosis of stimuli present with failure to capture is relatively limited (Table 7.1). A likely etiology can often be established simply by knowing when the problem was encountered with respect to lead implantation. If the loss of capture occurred within hours or days of the implant, the most likely explanation is lead dislodgment. Loss of capture occurring weeks to months after implantation is most likely to be due to high capture thresholds resulting from the lead maturation process although this is less likely in the past decade due to the routine use of steroid-eluting electrodes. 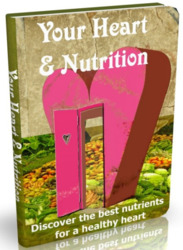 If this problem occurs many months to years after implantation, it is usually due to a mechanical or structural problem with the lead (such as damaged insulation or a conductor fracture) or due to an abnormality in the myocardium itself. During this time, it is also appropriate to consider extracardiac causes such as metabolic abnormalities or pharmacologic agents. Failure to program an adequate output safety margin may result in loss of capture due to physiologic variations in the capture threshold. Latency from the pacing stimulus to the onset of the P wave or QRS complex may simulate loss of capture. Eventually, the battery will deplete such that the actual output, despite its programmed value, will fall below the capture threshold, resulting in loss of capture. * In ECG column, normal refers to a stable morphology of the evoked potential; abnormal refers to a change in the morphology of the evoked potential. ^ In the chest radiograph column, normal refers to stable lead position and no obvious deformity of the conductor coil; abnormal refers to a change in lead position or a deformity of the conductor coil. The insulation is radiolucent and will not be visualized on the x-ray. * The ECG with an insulation failure involving a unipolar lead will show a decrease in the amplitude of the pacing stimulus. An insulation failure involving the outer insulation of a bipolar lead will show an increase in the amplitude of the pacing stimulus. Failure of the internal insulation of a coaxial bipolar lead will show a decrease in stimulus amplitude. This presupposes that all recordings are made with an analog ECG machine. § The ECG with an intermittent conductor fracture may show a varying amplitude pacing stimulus if recorded with an analog ECG machine. See Table 7.3 for a total conductor fracture. 11 Pacing threshold is increased as measured through the depleted generator but is normal through the PSA. Source: Modified from Levine PA. Pacing system malfunction: Evaluation and management. In: Podrid PJ, Kowey PR, eds. Cardiac Arrhythmia: Mechanisms, Diagnosis, and Management. Philadelphia: Williams & Wilkins, © 1995. By permission of Williams & Wilkins. A change in the morphology of the capture beat is often a clue to lead dislodgment, but this is the case only when fusion with the native QRS complex is absent. Fusion can also occur in the atrium. The morphologic changes in the paced P wave when combined with the native atrial depolarization are more difficult to identify because of the smaller size of the atrial complex. In biven-tricular systems, one has to be concerned with the position of two ventricular leads—one in the right ventricle and the other stimulating the left ventricle. High Thresholds; Lead Maturation: When the electrode is first inserted, it is making intimate contact with the endocardium. The presence of foreign mate rial and the pressure of the lead-electrode system against the myocardium induce an inflammatory reaction at the electrode-myocardial interface. This local trauma is responsible for the current of injury pattern on the acute EGM recording. Due to the inflammatory reaction, the electrode is physically displaced from the excitable myocardium. This process increases the capture threshold. In addition, it attenuates the electrogram amplitude and slew rate to compromise sensing. With time, the inflammatory reaction subsides, leaving a thin capsule of fibrous tissue between the electrode and active myocardium. As the distance between the electrode and active myocardium is reduced, the capture and sensing thresholds improve. Early experience with systemic steroids to limit acute threshold rises led to the development of the steroid-eluting electrode, which has been effective in attenuating the inflammatory reaction and its associated early rise in capture and sensing thresholds.15-20 Isolated cases of massive threshold rises have also been encountered with the steroid-eluting leads, although the incidence is probably lower than with non-steroid-eluting leads.21,22 Acute management of high thresholds, with or without loss of capture, requires increasing the output of the pacemaker. If this is not feasible, one needs to determine the status of the native underlying rhythm. If it is stable and adequate to physiologically support the patient, one might simply wait for the threshold to fall or try a course of high dose systemic steroids. If the underlying rhythm is not stable, one will need to insert a temporary pacemaker lead and consider an urgent intervention to reposition or replace the lead. If thresholds increase during the early postimplantation period and one elects to use systemic steroids in an attempt to reverse the phenomenon, a regimen of 60 mg of prednisone per day, often administered in divided doses, has been found effective in approximately 50% of patients. In the pediatric population, the dose is 1 mg/kg. Capture thresholds are repeated 4 to 5 days after the initiation of steroids. If there is no change or if there is a further increase in capture thresholds, the steroids are considered ineffective and are simply discontinued. If the threshold, however, has decreased by at least two programming steps (pulse width and/or pulse amplitude), it is likely that the steroids are effective. The steroids are then continued for a month, with biweekly monitoring of capture thresholds. At the end of the month, a slow but progressive tapering schedule is initiated that continues for a minimum of 2 months. High Thresholds; Chronic Lead: High capture thresholds may develop at any time. Those that are not associated with the acute lead maturation process are not likely to respond to steroids. When this problem is encountered, one should evaluate the patient for transient etiologies, including electrolyte and acid-base abnormalities such as hyperkalemia and acidemia.15-17,23-26 Also included are pharmacologic agents such as the antiarrhythmic drugs; the 1C agents such as flecainide have developed a particularly poor reputation.27-30 If a transient cause is identified and it can be corrected, the problem can be managed with a transient increase in output or by use of temporary pacing until the situation has resolved. One must be very cautious about invoking the diagnosis of a high threshold due to a primary myocardial process in the absence of a change in the morphology of the intrinsic P wave or QRS complex. With a stable native complex on the surface ECG, a more likely explanation is a primary problem developing with the lead itself. If the malfunction were due to a mechanical abnormality developing in the lead, one would expect to see a change in the telemetered or invasively measured stimulation impedance, although this may not always be the case. Normal telemetry values may occur in the presence of an intermittent problem if the lead was functioning properly at the time of the measurements. When the lead impedance is abnormal, a very low impedance value (commonly less than 200 ohms) reflects a failure of the insulation, most commonly the inner insulation in a coaxial bipolar lead. A very high lead impedance (greater than 2000 to 3000 ohms) is consistent with a complete conductor fracture (open circuit). Measurement-to-measurement changes in telemetered lead impedance that are still within the normal range are totally consistent with normal lead function. Changes up to 300 ohms may still be compatible with normal lead function.33 Further, a change in the measured impedance in the absence of a clinical malfunction, such as a massive rise in capture threshold, noncapture, or a sensing problem, may be a telemetry error. Although this might warrant closer follow-up assessment, an isolated abnormality of a telemetry measurement does not mandate operative intervention. Lead Insulation Defects: An insulation defect may develop from the intrinsic design and/or a manufacturing limitation as was the case with an early series of 80A polyurethane insulated leads. Most insulation problems, however, are due to extrinsic forces applied to the lead either at or following implant that physically damage the lead. 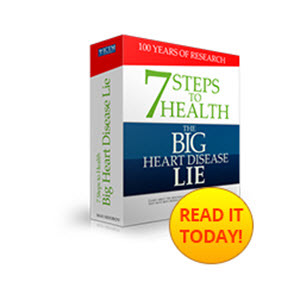 In part, this problem is a direct result of the request by the medical community for thinner leads, both unipolar and bipolar. One method of reducing the lead's diameter is to reduce the thickness of the insulating material. In-line bipolar coaxial leads are the least forgiving of extrinsic stresses for this very reason. Insulation defects have occurred with both silicone rubber and polyurethane insulation material.34 Industry continues to evaluate new materials having the relative benefits of both polyurethane and silicone rubber while minimizing some of their weaknesses. A third mechanism involves abrasion of the external insulation. This may occur between overlapping coils of the same or contiguous leads or between the housing of the pulse generator and the lead coiled behind it. Manifestations of a lead insulation defect are determined, in part, by the location of the defect.40 In unipolar leads or a defect associated with the proximal conductor of a bipolar lead, there may be extracardiac muscle stimulation due to the electrical current leaking from the defect. 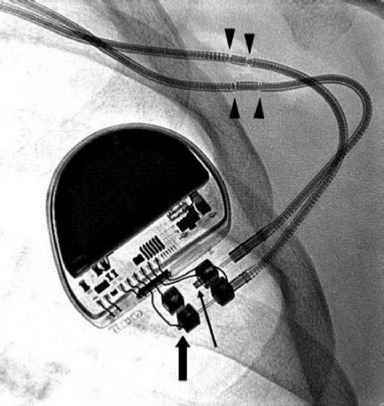 Muscle stimulation in the area of a unipolar pacemaker may also be due to an upside-down pacemaker with the anode or indifferent electrode making direct contact with the underlying muscle. The author is also aware of several cases in which the insulating material applied to the pulse generator was damaged, thus allowing for local muscle stimulation with a totally normal lead. Figure 7.3. Lead fracture diagnosed on chest x-ray. 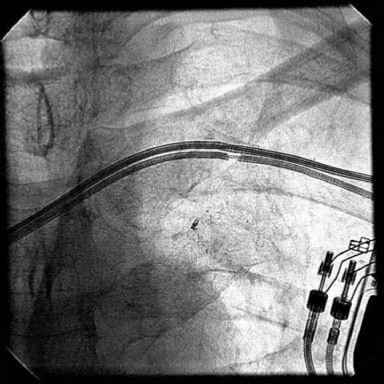 Three years after dual chamber pacemaker implant for sick sinus syndrome this patient was found to have complete loss of ventricular capture and bipolar lead impedance of greater than 2000ohms. There is a clear fracture of the lead just before it enters the subclavian vein. The fracture may have been due to the subclavian access that passes the lead through the costoclavicular ligament apparatus. There is a slight deformity of the atrial lead at this position suggesting compressive force on this lead as well. of a bipolar lead, there will then be two pathways for current flow. This will result in a larger "unipolarized" stimulus on the ECG. If the insulation is breached between the distal and proximal conductors of a bipolar lead, the current flow will be short-circuited and little or none of it will ever reach the active electrodes. In this case, the already small bipolar stimulus amplitude will be further attenuated. In any case the shunting of current through the insulation defect and away from the myocardium can result in higher capture thresholds. Sometimes an intermittent problem is identified on a Holter monitor or is suspected on the basis of symptoms, but when the patient is evaluated in the office, the system is functioning properly. This is particularly likely if the insulation defect occurs between the proximal and distal conductor of a bipolar lead. Figure 7.4. Repeated ventricular oversensing with resultant inhibition was demonstrated in this dual bipolar DDD pacing system. Measured data telemetry reported a ventricular lead impedance of less than 250ohms; the baseline had been 645ohms. Telemetry of the ventricular electrogram while simultaneously recording a surface ECG demonstrates non-physiologic large electrical transients (arrows) occurring at a time when the pacemaker is being inhibited, indicating that the pacemaker is sensing these signals. The ventricular sensitivity had been reduced in an attempt to minimize this oversensing problem. However, the nonphysiologic transients were approximately 20mV, larger than the least sensitive setting of the pacemaker, and the oversensing continued. However, the reduced sensitivity resulted in undersensing of the native R waves, resulting in competition. 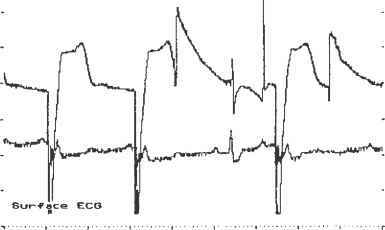 The nonphysiologic electrical transients were treated as PVCs by the pacemaker and activated the PVC algorithm, extending the refractory period and resulting in intermittent functional atrial undersensing. around the anchoring sleeve is for the examiner to trace the course of the subcutaneous portion of the lead with his or her fingers while applying pressure at each point. If there is an insulation defect, the two conductor coils will be pushed together, unmasking the problem. Extending the ipsilateral arm as high as possible, as in reaching toward the ceiling or placing the arm behind the back and rotating the shoulder backward, may unmask a problem caused by the medial subclavian-muscular complex. Obtaining a chest radiograph may reveal a problem, although the insulation defect alone will not be seen because the insulating material is radiolucent. One might see a deformity of the conductor coil (Fig. 7.5) allowing one to infer the diagnosis when these observations are combined with the clinical and telemetry data. However, a radiographic abnormality in the absence of independent corroboration of a system malfunction would be insufficient grounds to recommend an operative intervention. Open Circuit: The most common cause of an open circuit is a conductor fracture. The second, but more embarrassing, cause is a failure to adequately tighten the set-screw in the terminal pin connector block of the pulse generator (Fig. 7.6). Figure 7.5. In-line bipolar coaxial lead with an indentation (arrow) created by a tight ligature around the lead. This has been called a pseudofracture and was previously considered to be of little clinical consequence. It has since been learned that the excessively tight ligature predisposes to both conductor fractures and insulation defects. Figure 7.6. 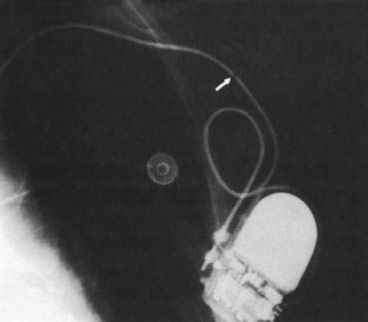 Chest radiograph demonstrating displacement of the terminal pin out of the head of a pacemaker. For the atrial lead entering the top of the header (bottom of the figure) the terminal pin is seen extending beyond the header posts for both the ring and tip electrodes (heavy arrow). The ventricular lead, however, does not reach to the header post for the tip electrode (thin arrow). The ventricular lead impedance was unmeasur-able. In addition, pseudofractures are seen in both leads due to constriction of the insulation by the tying sleeves (arrowheads). What does a pacemaker lead fracture look like on xray?